Discussion in 'Assetto Corsa Competizione' started by GTPNewsWire, Jul 18, 2018. 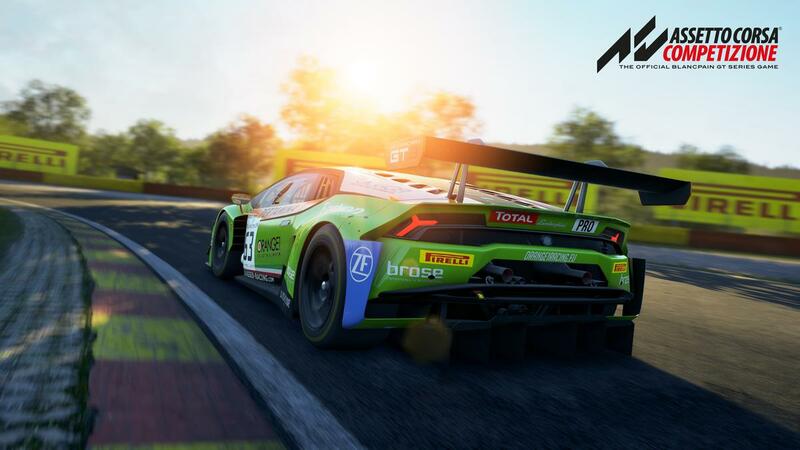 This article was published by Michael Leary (@Terronium-12) on July 18th, 2018 in the Assetto Corsa Competizione category. Whitestar, super_gt and th3o like this. Looking forward to playi ACC at home with my own setup, which doesn't exist anymore because I stopped gaming a looooooooooong time ago. I live about one hour drive from Spa but I'm not going to go to the 24h. This guy has a paddock ticket! Hopefully I'll get a chance on Friday to check it out. East27 and Terronium-12 like this. Why waste time and money on a useless gimmick that is only being used by a small fraction of players? Alpha Cipher and Vigne like this. Assetto Corsa Competizione is VR Ready, and ensures full compatibility with a wide range of peripherals from gamepads to professional steering wheels. that's from feb. people have been asking and they have said "we don't know" after e3 basically. This whole announcing a date for when announcing the date nonsense needs to stop. Dopplegagger and ivann like this. But then you realise that this thread is actually an announcement on an announcement for an announcement. 20832, Alpha Cipher, Corsa and 3 others like this. Because VR is a massive part of the future. Without doubt. East27, SpecMiata-JSW and super_gt like this. I've logged +700 hours with my HTC ViVE and it's more of a hassle than anything (pixelated, loads of wires and very expensive...) but okay, I can meet you half way, if they do manage to sneak it into the game, I can test it for an hour or two, but really, it's just a fad. He feels it's a fad, you feel it's not, while I agree with you VR is here to stay and will only get better that doesn't mean any of us can tell other members to "gtfo" or get the hell out of here. I'm not a moderator, your words are just extreme. Faultier and factchecker like this. The article here is just GTP sharing the news. Not the same thing. So what you are telling me is that GTP has made an announcement for Kunos making an announcement that they are going to make an announcement at Spa. That's what you're telling me, and what I'm not telling you. It’s worth noting that a paddock ticket is necessary to take part in the festivities. sensitive much? sounds like someone needs a safe space! Luckily i don't not need to 'wait' four years this time between announcement and release. Think we will get the release date for EA right from the start of the weekend or will Marco climb up on the podium Sunday after the race and scream it into a microphone? "The EA date will be revealed this Friday during #SRO press conference, that will take place at 4:30PM CEST." TheRacer94 and th3o like this. So i guess the EA will be available for purchase come September 12th, not before? I see it now on the October build! Here’s some of the most interesting stuff from the stream earlier today. I dreamt about the GT2 being in ACC one day but the road map ended it. Jokes aside, i found the SRO presentation very interesting and it’s really worth watching because of all the changes. DaigoD, Vendrah, BeetesJuice and 1 other person like this. Question here. What does early access mean? Full game release is in the 1st quarter of 2019, so what is early access? Does everybody get early access and what is the cost? 69 year old driver is confused. 3) Early Access means you can play an early version of the game with limited content. Your game will be updated as they release more and more content until the full release. In this case, it will start with one car and one track. Then will grow over the next couple months. At the end you will have the same game as everybody else who buys the full priced game when it releases Q1 2019, just that you payed way less because you joined during Early Access. letsdothis97, Faultier, VetteZR1 and 1 other person like this. VR support is official. It is mentioned in build2. I really did not get all the fuss you VR-guys were making anyways. I mean honestly, how could you have imagined that they could not support VR. I mean, really? It's such an apparent game changer for many simracers, of course they would include it. You know how the internet works. One little lie or misinformation or no information from the developer and it becomes a hype.